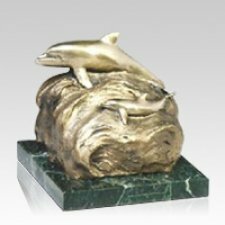 The Peaceful Sea Dolphin Keepsake Cremation Urn is a lost wax cast bronze with a natural bronze patina and a protective lacquer finish. Mounted on an exquisite, rich brown granite base. A wonderful keepsake urn for a lost loved one.